It was like staring into a crystal ball and seeing a monumental event that’s about to change your life. In that post, I made the case for Big Data as well as I could, and I’m not going to repeat it here. Rather, this time, I want to try to convey the immense and far-reaching impact that the Big Data revolution will have on the media business. Let’s start at the micro level, in one of these recent vendor demos. A couple of Morris colleagues and I had asked this potential Big Data partner to show us the online interface, or dashboard, through which we would be able to build target audiences for local businesses. “How about a veterinarian in the Augusta market?” one of us said. Our all-digital agency, Main Street Digital, had had some good success building digital services packages for some customers in that category. We’d found them quite receptive. No problem, the vendor said. He made a couple of clicks, and the screen revealed that there were 51,000 people in the Augusta market that owned dogs or cats. “What about horses?” Click — we’re looking at a number for horse owners in the market. Dogs? Click — there’s the number. Cats? Click — there’s the number. Okay, what if we want to limit it to a certain radius around the vet’s clinic? Sure. Click — there’s the number. Okay, what if we want to market to these people? Click … and we’re looking at a list of their names, addresses and phone numbers. Their names, addresses and phone numbers. KA-BOOM! A bomb went off in my head. Now we can market to these people directly. We know who they are, we know where they live, and we know how to reach them. Intellectually, I had been fully aware that this was possible using Big Data. But seeing how easy it was to drill down into the entire population of the Augusta market, segmenting hundreds of thousands of people down into a set of specific characteristics and then a set of marketable names…. Exactly the people a veterinarian would want to reach…. Wow. And the characteristics above barely scratch the surface. Income range, lifestyles, make/model/year of car owned, most effective media to reach them, propensity to donate to charities and much, much more. The list of known and usable attributes for marketing segmentation is vast. You may be thinking, what about privacy? That’s a discussion in itself, but for now suffice it to say that the Big Data providers are scrupulously careful to obey the laws governing storage and use of the data they handle. 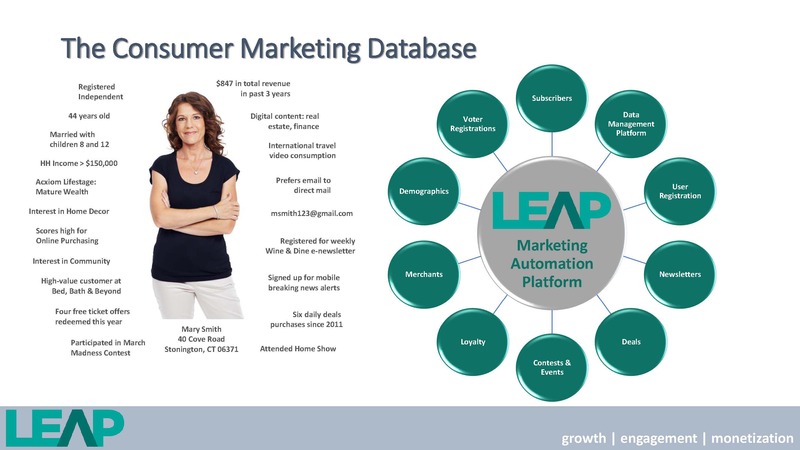 It’s from LEAP Media, one of the vendors helping us deploy Big Data in our markets. Folks, we aren’t in Kansas anymore. You didn’t know who was who, so advertising was a matter of putting your message in a medium that would be read, seen or heard by almost everyone. If you were a tire dealer, you knew there were a few people among the population who needed tires, and you hoped a few of them would see or hear your ad. That was the best you could do. I also remember our wonderment at my family’s newspaper back in — was it the 1980s? — when PBS (Publisher Business Systems) pitched us on a new-fangled circulation computer system that would have a complete “subscriber/non-subscriber database” — including every household in our market. We could hardly believe it. And I remember, when I was managing publisher at The Christian Science Monitor from 1997 to 2005, that we were using what we considered the sophisticated magazine subscription marketing tactics of the time. We spent $1.5 million a year sending highly targeted direct-mail subscription offers to carefully chosen audiences. Chosen, that is, on the basis of just one fact — they were on the subscriber lists of The Economist, Foreign Policy magazine or other publications we thought would attract readers who would enjoy The Monitor. We rented those lists and hoped for the best. What I saw on the screen during the Big Data demos tells me those days are ending. It won’t be long before precision targeting is the universal standard for most forms of advertising, even in local markets. Messages will go through whatever channels work best for reaching the people in the specific target audience — another of the data points available on each individual. The channels will be targeted digital banners, social media targeting, email, direct mail, telemarketing, niche print and, soon, addressable cable television. In this new world, what will happen to the mass-marketing media — newspapers, television and radio? As more and more marketing dollars move to targetable media, they will be seen as best suited for products, services or companies who actually want to reach very broad audiences rather than just narrow slices. However, mass-media audiences are becoming less and less mass as people spend less time on them. These channels will increasingly be seen as niche media. Advertisers will judge them on the basis of their specific audience characteristics — and their cost as compared to the many other ways of reaching exactly the same target individuals. What’s a local media company to do? As I wrote in the blog post cited above, we need to be first and best at selling these new targeting capabilities in our markets. This means we need to be the providers of the data as well as the marketing programs those data make possible, using whatever combination of channels will provide the best return for the dollars spent. And we need to know, in full Big Data detail, the characteristics of our own audiences — both print and online — so we can demonstrate their value for inclusion in the marketing programs we propose to local businesses. These local businesses will need a whole lot of help to take advantage of these new targeting capabilities. It’s the end of advertising as they’ve know it. And it’s the end of advertising as we’ve known it, too. But it won’t be the end for local media companies that master the vast possibilities of this new world. Posted on March 24, 2016, in Advertising, Audience, Big Data, circulation, Digital media sales, Disruption, management, marketing agency, Media business model, media management, media ownership, Revenue, Sales. Bookmark the permalink. 3 Comments. I’ve seen a few of these types of presentations myself – hell, I’ve even given a couple. So yes, this does portend some really tectonic shifts in advertising. The most immediate is going to be the death of the CPM. Why pay by the thousand to get your message to a whole bunch of people who could care less, when you could reach the one guy who needs&wants what you have to sell? That’s the whole panoply of CPC, CPA, etc. etc. Basically, as advertising becomes more efficient, we’re going to have to start charging a whole helluva lot more to deliver the thing that advertisers want: sales. How will that shake out? Maybe we’ll all be doing some mutant version of affiliate marketing, where we get a slice of the transaction? Remains to be seen. But more than anything else, this is going to require a serious capital investment on the part of publishers, to bring in people to the ad sales team who actually understand digital ads, delivery platforms, conversion rates, and how to customize&read Google Analytics reports. And people with skillsets like that, don’t come cheap.